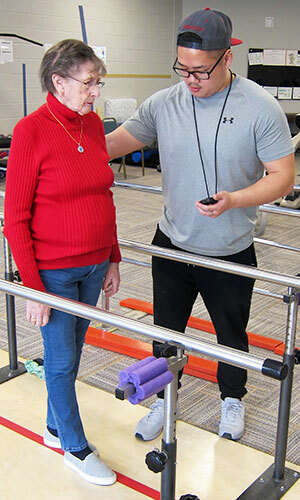 Marianne Sackett, a resident of Oak Crest, participates in the SCOPE test under the direction of NIU graduate student Josh Pak. Excessive sitting, some say, is the new smoking – in other words, something that insidiously contributes to shortening a lifespan. But what does that mean for elderly people who live in nursing homes or retirement communities, where very little time is spent standing or moving? Little scholarship on this matter exists on that population, Sebastião says, who are different from their counterparts still living at home in their communities. Residents of DeKalb’s Oak Crest Retirement Center are participating in Sebastião’s current research project to help him understand how sitting impacts their lives and what “interventions” he can develop or suggest to get residents to sit less and move more. Called “SCOPE” (Sedentary Behavior, COgnition and Physical Function in OldEr Adults Living in a Retirement Community), his work examines how sitting affects not only the physical fitness of the Oak Crest residents but their mental fitness as well. 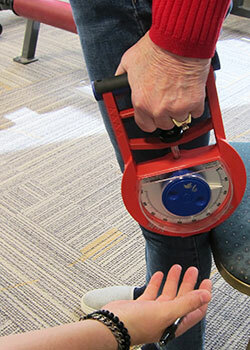 Tests for physical fitness gauge upper- and lower-body strength, record how many steps they can take in two minutes, county how many times they can stand up from a chair in 30 seconds, assess their gait while walking a straight line for a certain distance and pivoting for a return and how far measure they can lean ahead without losing their balance. Speed is a critical factor, Sebastião says: People who walk quicker live longer. Cognition, on the other hand, is evaluated through verbal and visual memory skills. Sebastião recites 16 words to the test subjects and asks to hear them repeated back to him in any order. When he completes his study – he’s hoping to examine 100 people, and is about three-quarters of the way there – he will have valuable data for the next step. Possible “interventions” to help those in need include wearing Fitbits or similar devices that track footsteps, standing or walking around the living room during TV commercials, engaging in exercise that improves cardiorespiratory or muscle fitness or seeking counseling to help them understand the importance of moving more and sitting less. Unfortunately, he says, much of physical activity behavior or the lack of it is most likely predetermined by personal habits earlier in life. Sebastião, who studies elderly and clinical populations by exploring factors that influence physical activity as well as creative ways to promote physical activity among older adults, received a six-month Dean’s Research Grant to conduct his work at Oak Crest. Two graduate students and one undergraduate student are assisting him. All will write their own papers; they also will combine to pen a group paper, with Sebastião as lead author, for submission to journals on gerontology and geriatrics. The undergraduate student, meanwhile, will present at the College of Education’s Third Annual Student Research Symposium, scheduled for Friday, April 20. 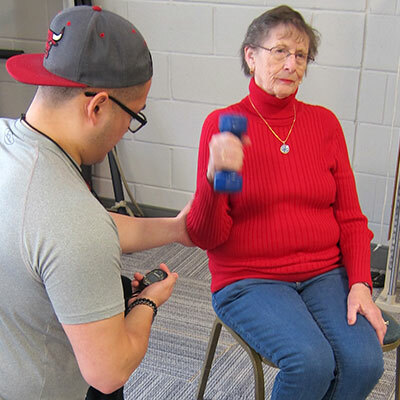 Josh Pak, who is pursuing a master’s degree in Exercise Physiology, is enjoying his chance to work with the senior citizens. He believes that his collaboration with Sebastião will equip him well in his eventual career, in which he plans to work with elderly adults on cardiac rehabilitation.